Coming into this season not a lot of people knew about Central Catholic’s Aaron Washington Jr. (5-8 170 Jr. CB/ATH), but get used to the name as the kid is one of the top defensive backs in the entire northwest. Washington made the transfer from Centennial after his sophomore year, to be a part of the power house that is the Central Catholic Rams. He got in the end zone multiple times last season, but switched schools after careful consideration. His father has been instrumental in helping him strive to be the best he can be, after moving here from North Carolina prior to his sophomore year. Aaron says, ” I want to thank my coaches for helping me and pushing me, as well as my family for being so supportive and coming to all of my games….I would really like to thank my dad for all of the sacrifices he has made to make sure I have had the opportunities I need to be successful in life”. Washington plays basketball and track as well, but his main focus is football. 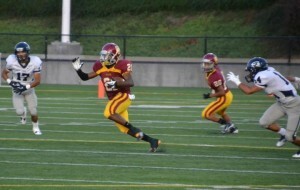 Last week against Skyview Aaron looked like one of the top corners and kick returners in the state. He didn’t take a pick to the house or return a kick, but you can just tell that he has that “it” factor. 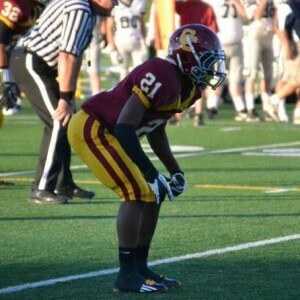 Washington is ranked as one of the top defensive backs in Oregon by NEI for the 2014 class and he is quickly rising. The state’s current top defensive back Dallin Leavitt who is committed to BYU says, ” the kid is real, he could easily be the best DB in the state next year”. This coming from a kid that doesn’t give compliments freely and understands what it takes to be the best. ” With continued work I think Aaron will be a special player, I feel like he has a lot of the same type of characteristics as I”. Aaron says,” I want to win a state title first and foremost and also be a 1st team all league, and 1st team all state DB.” He continued, ” Ive been playing since I was 5 years old, and the transition to playing ball here has been good.. The South is much different as everyone starts playing much sooner in life”. It took me all of about 2 quarters to realize how much talent Washington possesses. He’s going to be a kid that will break multiple kick and punt returns over the next couple of seasons, as any time he gets a lane it’s a 50/50 shot he’s gone. 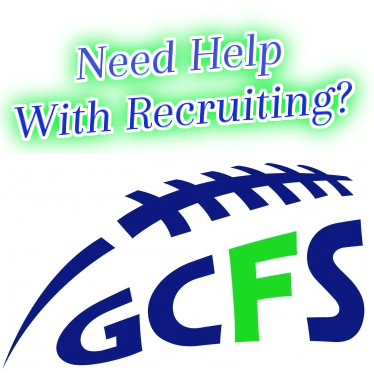 Aaron says,” Ive learned a lot already from guys like Dallin and the incredible coaches that we have”. Head Coach Steve Pyne has done an outstanding job of grooming top athletes such as Washington so expect nothing less. In closing Washington says, ” Im just very grateful and want to thank my teacher Ann Haverkamp, and my best friend Karley Buckland for helping me keep my head straight and my goals in line during the transition”. We will hear a lot about Washington moving forward, the kids a gamer.